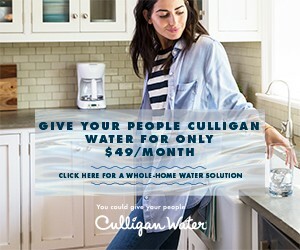 For a limited time, you can recieve a Culligan HE Water Softener, the world's most effecient water softener, as well as our premium Aqua-Cleer Advanced Drinking Water System. We will also throw in a wireless ClearLink PRO for FREE! Sustainability -- ditch your disposable water bottled for good! Convenience -- cleaner water straight from the tap; no faucet required. Everything on your terms -- buy, rent or finance. Whatever works for you.